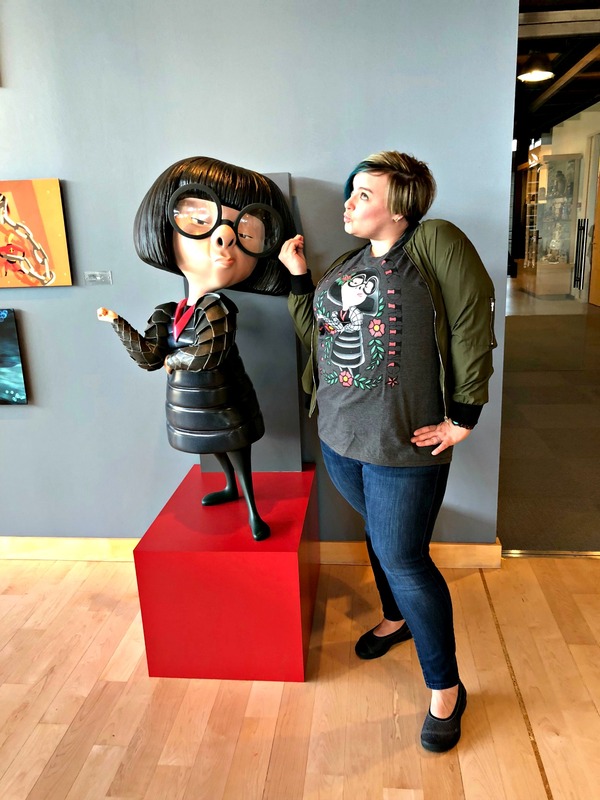 A few weeks ago I was invited by Disney Studios on an all exclusive press trip to visit Pixar Animation Studios in Emeryville, California, for INCREDIBLES 2 Early Press Days to give my honest opinion and report back to you what the experience was like. 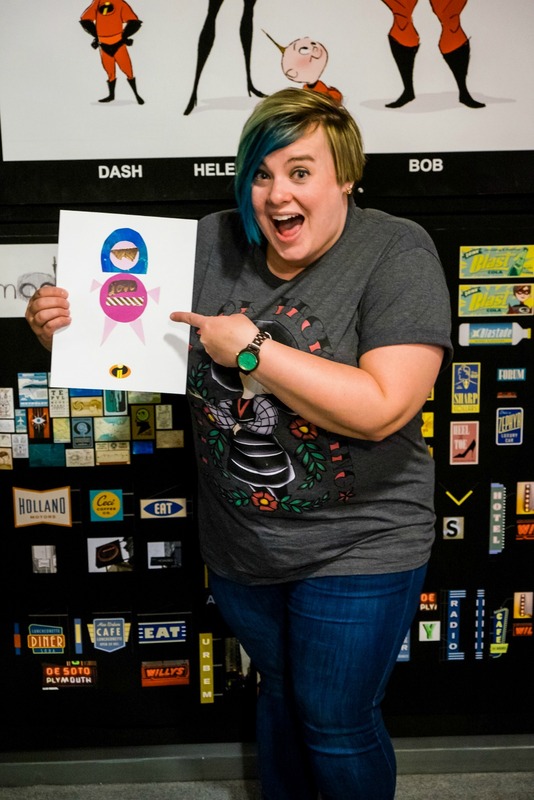 While I was at Pixar Animation Studios I was able to tour the Pixar offices, see the Pixar Animation Studios Archives and come home and report to you all what it’s like to take a Pixar Animation Studios tour! 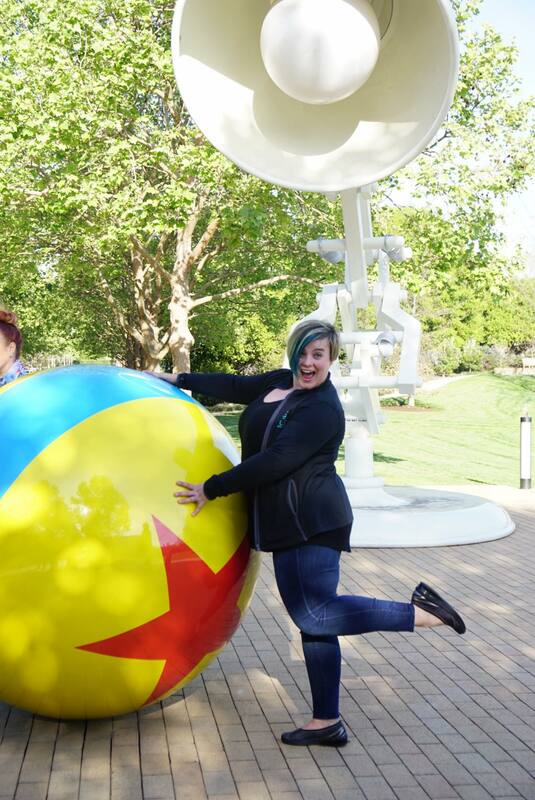 I toured Pixar Studios and this is what it was like. 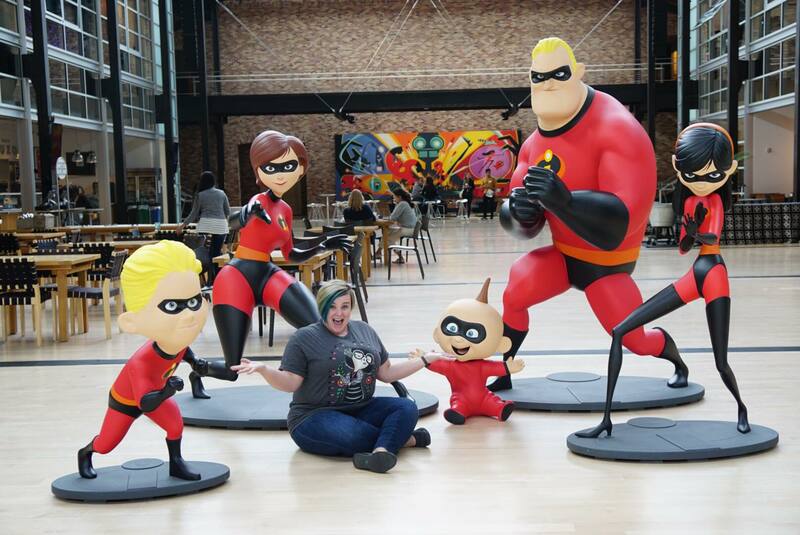 How do I tour Pixar Animation Studios? You need to be invited. Due to the number of projects Pixar Animation Studios is constantly working on, Pixar Studios is a closed studio. That means it’s not open to the public. 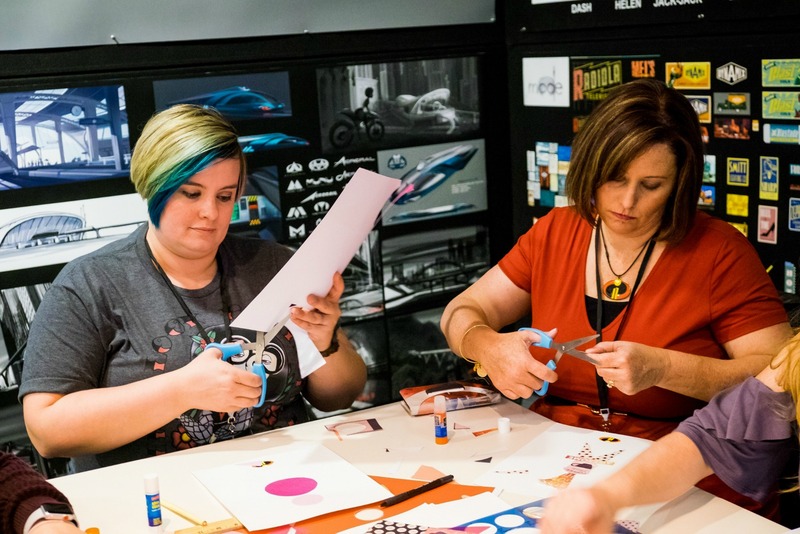 You need to either know someone who works for Pixar or be invited to tour the studio. There are also charitable auctions for Pixar tours. What does Pixar Studios look like? 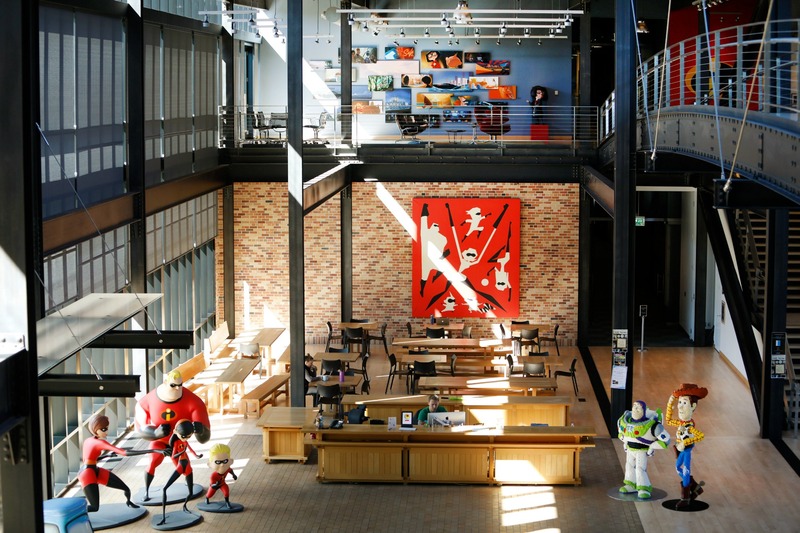 The photo above is the atrium of Pixar. You walk in through the doors which are by the Incredibles family. Across from the doors you can see this huge mural of concept art for INCREDIBLES 2. I think one of the first things I learned and began to truly understand about Pixar and their process was how important concept art is. 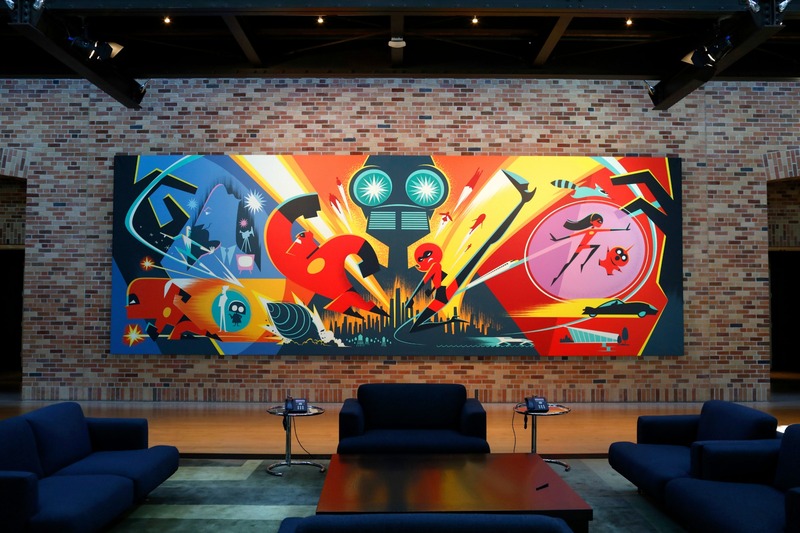 With every feature film Pixar has either recently released or is working on, they change out the decor in the Steve Jobs Building to reflect that. While we were there, COCO, Pixar’s 2018 Academy Award winning featured film, had concept art, color scripts (which is like an story board shown through color and is meant to evoke emotion), sculptures (professionally called “maquettes” which allow the computer to create a 3D render of each character), and even the walls were painted in COCO colors. That was one side of the building and I wish I had photos to share with you of the COCO art because it was rich and deep with emotion alas, no cameras allowed up on the second floor of the Steve Jobs Building. 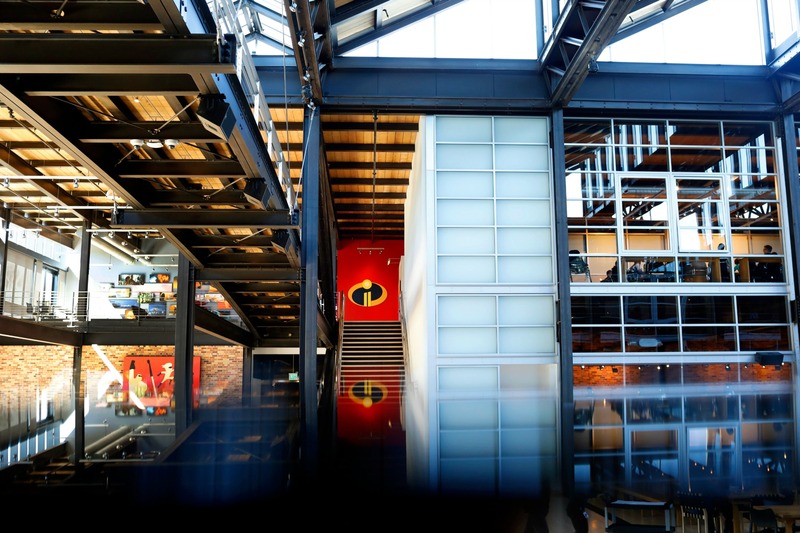 The other side of the Steve Jobs Building at Pixar Animation Studios you’ll find everything devoted to the newest Pixar feature film: INCREDIBLES 2. 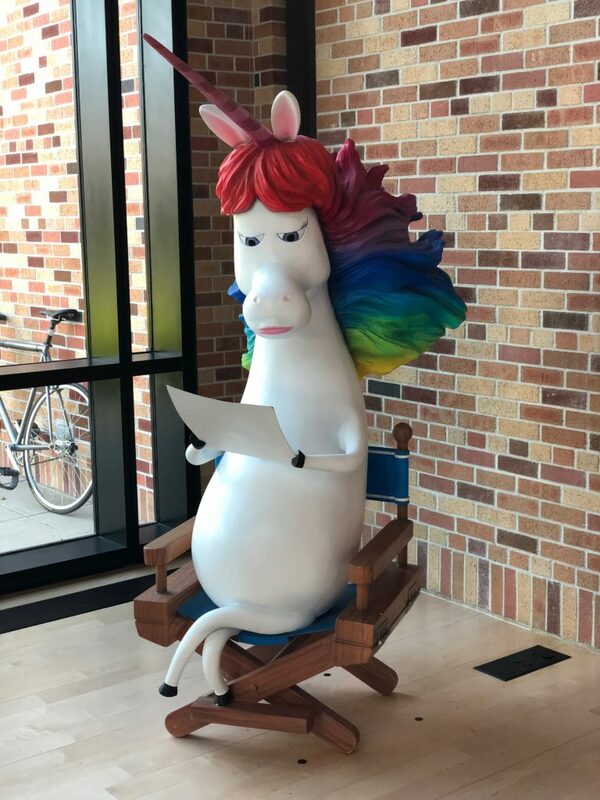 What I thought was so amazing as we were touring Pixar Studios was how much time and energy the studio puts into providing a creative environment for their employees. Did you know that they paint the walls a different color when they switch out the artwork? Every single time. Pixar doesn’t have to do this; it’s part of their creative process. 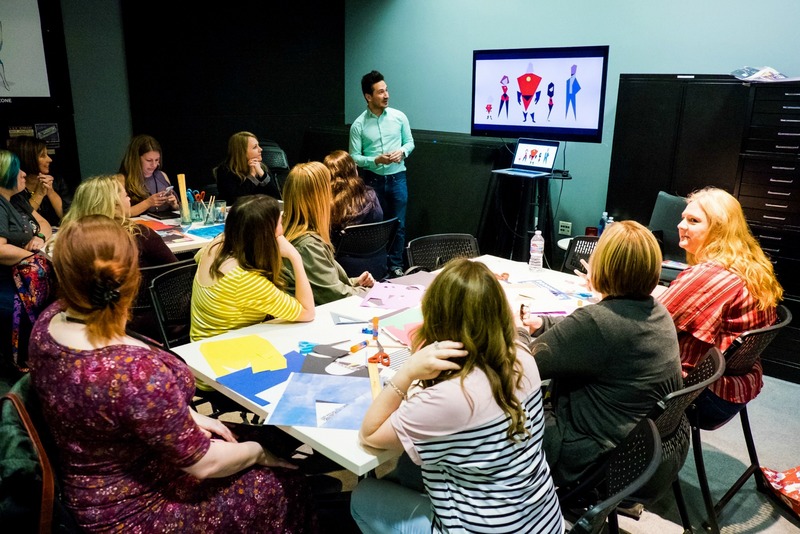 Touring the halls of Pixar Studios made me realize how important it is for every person who has a part in the making of a Pixar film to feel creative. That’s why Pixar Animation Studios holds the records for the most animation Academy Awards wins. Why does Pixar have so much artwork? It’s all part of the creative process. So much goes into a Pixar film and it’s so much more than just plugging things into a computer. Since the Pixar animators are constantly creating every doodle, notebook sketch, coffee-stained napkin drawing goes into the Pixar Archives. 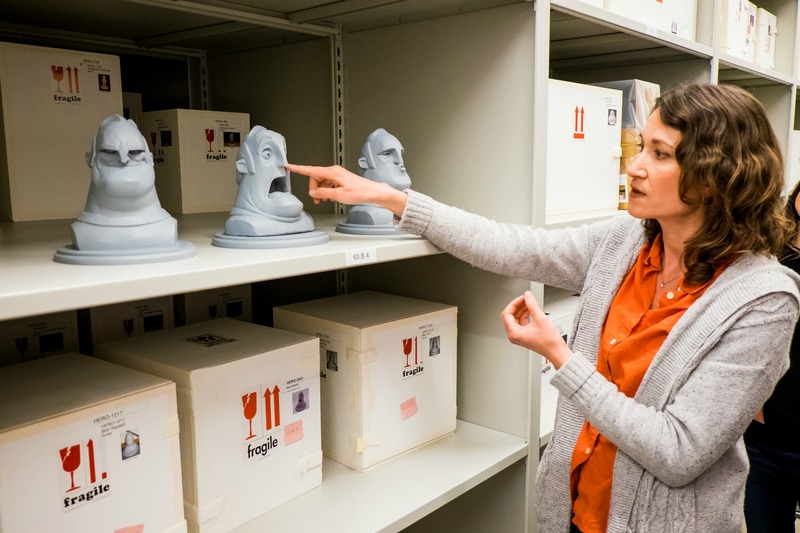 The Pixar Archives are located near the Pixar campus but it’s in a secret location and many of the Pixar Studio employees don’t even know where it’s located. The purpose of the Pixar Archives is to preserve the artwork (obviously) from every single Pixar feature and short film. At first I wasn’t sure why they animators themselves wouldn’t just save their drawings or throw them away (if any archivists are reading this right now they are cringing and probably in the fetal position on the floor) but Juliet Roth, who is the Archives Manager for Pixar Animation Studios, showed us how important the artwork for the first INCREDIBLES film was as Pixar started working on the second INCREDIBLES film. 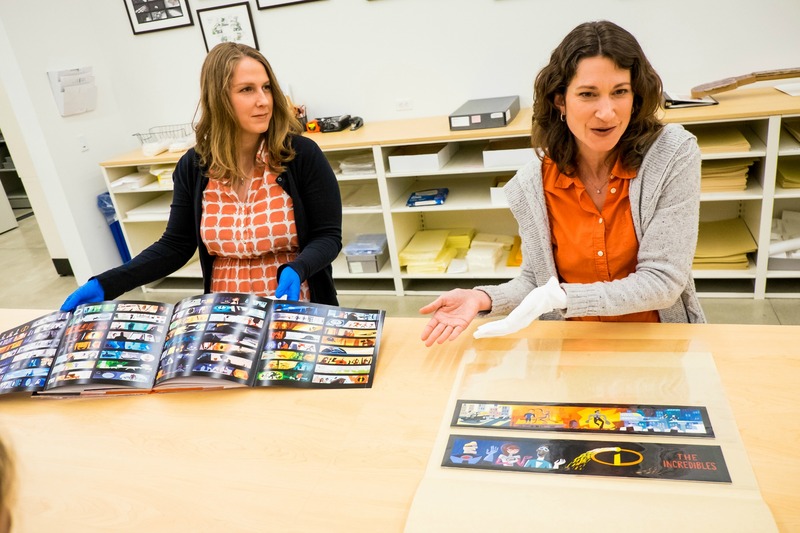 How are the Pixar Archives used by Pixar Animation Studios? It’s been 14 years since INCREDIBLES was released in theatres (even earlier than when the studio began working on the first film) and a lot has changed from technology and such. 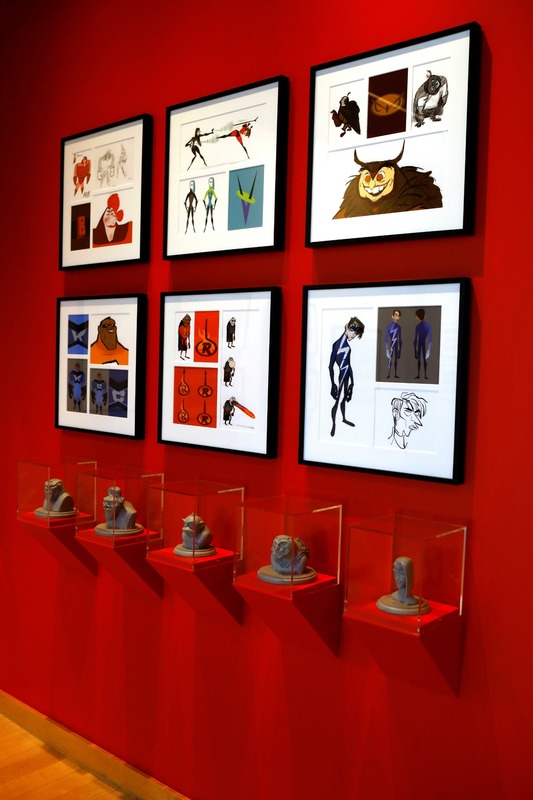 The animators needed to reference the original artwork, maquettes (pictured below) and notes from the first film so that they could make INCREDIBLES 2 a seamless continuation of the story. INCREDIBLES 2 picks up where the first INCREDIBLES ends so being able to have all of that artwork from the first film was vital to the success of the sequel. What is concept art? Why does Pixar create it? You know how you see really cool artwork for some of these films and you’re like, Oh, that’s neat that they made something to sell after the film’s released, well, that cool artwork really has nothing to do with merchandise and everything to do with the creative process. The first part of the creative process we learned is creating concept art. Character Artist Alonso Martinez showed us how one of the first parts of creating a character is to create a mixed media collage of shapes. There are a ton of new superheroes and villians in INCREDIBLES 2 and to come up with each one animators just went to town brainstorming, creating whatever super hero cam to their mind. It starts out very simply, using shapes. I’m not a crafter but I loved this activity. My super hero is called Preggo Girl, she creates human life. Where can I find the Pixar Statues? Those are located specifically at Pixar Animation Studios. They’re throughout the halls and are perfect photo opps! Where are the Pixar Lamp and Ball Statues? These are right outside of the Steve Jobs Building (Jobs founded the studio in 1986 after acquiring the computer graphics division of Lucasfilm). The iconic Lamp and Ball are actually characters from the short animated film LUXO, JR. which was released in 1986. The statues were part of an exhibit in Australia and when the museum exhibit was over, they sent the statues to Pixar Animation Studios in 2008.